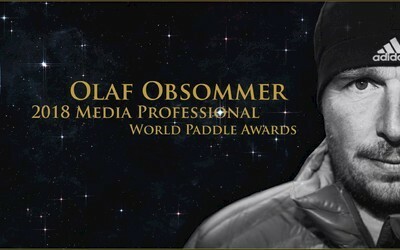 Dies verkündete heute die World Paddle Award Akademie in einer Pressemeldung. Damit geht auch in diesem Jahr eine der beliebten Trophäen, der Oskar des Kanusports, nach Deutschland. Die Akademie bezeichnete Obsommer als lebende Wildwasser-Legende, der es mit seinen Produktionen in die größten deutschen und internationalen Medien geschafft hat und dort beste Werbung für den Kanusport machen konnte. Bei den Paddleawards setzte sich Obsommer gegen sechs weitere, internationale Media Professionals durch und glänzte bereits in der ersten Nominierungsphase, in der die Öffentlichkeit durch Votings in den sozialen Medien unterstützen konnte. Lesen Sie hier ein Interview der Akademie mit Olaf Obsommer zu seinem Award-Gewinn. Congratulations with winning the 2018 Media Professional award Olaf. What does this award mean to you? "Winning an award is always a certification that you have done something right in your life. So it looks like I’m on the right path in the right direction. It feels good and will help me to keep rocking to promote the best sport in world." You are known for your amazing videography and productions. What do you like most about filming paddlesports? "Mmm I am generally enjoying filming almost as much as kayaking as long its outdoors. It is more about those amazing and different humans I met along filming them pushing their limit." Can you share with us what was one of the most impressive film-trips you have ever done and what made it so special? "Way too many. I m doing it since 1996 so you can imagine a lot of things happened but one journey was outstanding and had nothing to do with kayaking. I had the pleasure to visit the Galapagos Islands and I filmed and filmed there 24h per day. My girlfriend wasn’t really happy about that…..sometimes you have to focus on priorities and the footage was insane .-)." Are there people you would like to thank? People who supported you. "If you begin with names and you will forget one…the trouble starts ,-) ….of course so many people helped me with my journey in life and I like to say big thanks to all my sponsors the past 25 years, without them it would have been different and not as good. And 1000 thanks to my parents for making me... 1000 THANKS, LOVE YOU that’s all."